State agency will continue to address rising oceans, even though effects might take a long while to see. STATEWIDE—Jack Ainsworth, executive director of the California Coastal Commission, went head-to-head and toe-to-toe with climate change deniers in calling himself a “pragmatist” and acknowledging sea level rise as a real problem. The quasi-judicial agency’s policy-making pursuits will continue to find ways to defend coastal and inland communities from changing sea levels, Ainsworth vowed during the public comment portion of the Coastal Commission’s Nov. 8 meeting in San Francisco. Coastal Commissioners, who met at San Francisco’s Aquarium of the Bay Nov. 7-9, discussed sea level rise on Day 1, but the topic was brought up again almost as soon as the second day of meetings started. Several representatives from the San Mateo County Association of Realtors, or SMCAR, brought up the Coastal Commission’s sea level rise policy guidance, stating some of its directives are confusing or not inclusive enough. Barbara LeVey of SMCAR spoke to commissioners about the agency’s sea level rise guidance policy. She questioned whether the commission received ample public input in crafting its guidance policy. LeVey added the guidance policy also focuses too heavily on residential development. The guidance policy, she told commissioners, should also give attention to commercial development and public works. Other realtors also questioned the clarity and technical direction of the Coastal Commission’s sea level rise guidance policy. Some of the guidance measures were too restrictive on residents, such as limiting lot line adjustments or focusing too much on size and age of structure. All speakers references a 95-page Coastal Commission document known as Residential Adaptation Policy Guide, or RAPG. One speaker said the document was crafted with input from a couple webinars and minimal public comment. “The Residential Adaptation Policy Guide itself 15 times mentions that the maximum public input is essential to the success of the RAPG. Yet, extraordinarily little public input has taken place – a couple of webinars and and two written public comment periods to the draft of a 95-page, highly technicla document … only a handful of people read does not come close to representing maximum public input,” Molly Whip, a realtor with SMCAR, told commissioners. Ainsworth, after hearing the realtors speak about the Coastal Commission’s sea level rise guidance policy for coastal residences, said he was willing to hold off on RAPG until additional public input is received. “In response … to some of the concerns raised here today I decided to hold off on moving forward with the residential adapation guidelines for additional outreach,” Ainsworth said. The Coastal Commission executive director added the revisitation of RAPG gives his staff an opportunity to clarify what, exactly, is in the document. “The purpose behind these residential guidelines is to provide a set of tools for local governments to help them prepare, to plan, for sea level rise, and to build resilient communities. It’s not to force down on top of our local governments any policy requirements,” Ainsworth said. Local governments were awarded 39 grants to address sea level rise issues, according to Ainsworth. The issue goes far beyond residential guidelines – local, regional and state agencies should be using as many tools as possible to protect all communities from the negative effects of sea level rise, an event Ainsworth said is occuring and must be addressed. Ainsworth added no one has all the answers, in terms of how to address sea level rise. They find Sharks teeth in Bakersfield so I guess the seas have rise and lowered thur history. There was a lake (that would be the 27th largest lake in the world today) in Southern California that existed until the mid 16th century. With a surface area of 5700 square miles of water the climate would be much more humid in So Cal. The disappearance of the lake corresponds with the mini ice age. Oh yeah I actually work for a living not living off the Govt teat..
Sea level rise will affect more than a handful of realtors. Boaters up and down the coast should have a say in how the Coastal Commission’s policies on sea level rise guidance affects them. 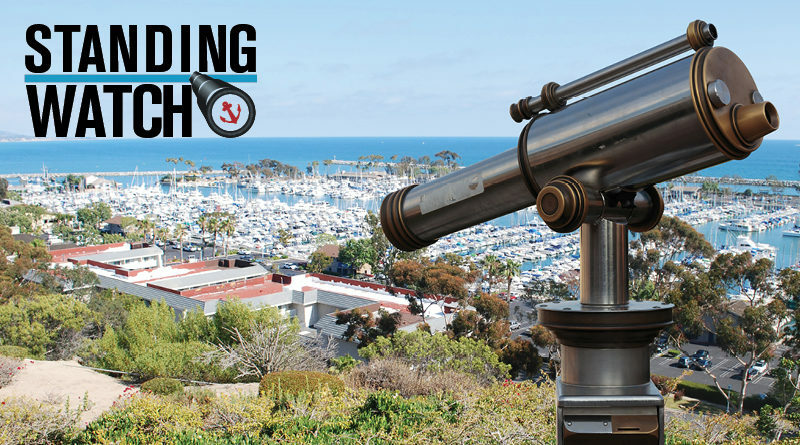 Reach out to the officials below to become a more active voice in the manner which the California Coastal Commission addresses sea level rise, especially with how the environmental phenomenon might affect local marinas and harbors.